Risk management is at the heart of professional real estate practice. The Virginia REALTORS® Legal Resources are designed to keep REALTORS® updated on legal issues relevant to your real estate practices and to reduce exposure to risk. 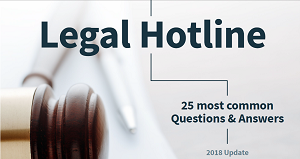 The Virginia REALTORS® takes time to collect the most commonly asked legal hotline questions and answers covering a broad range of topics including EMD, advertising, POA, broker supervision and more. Download your copy today!